"The HTC Titan is one of the new Windows Phone 7.5 smartphones to be announced today. It features a massive, 4.7-inch display and a 1.5GHz processor. We were live at HTC's launch event in London and were able to get some quick hands-on time with the new phone." If you are into big screen smartphones, like I am, you'll want to take note of this behemoth. 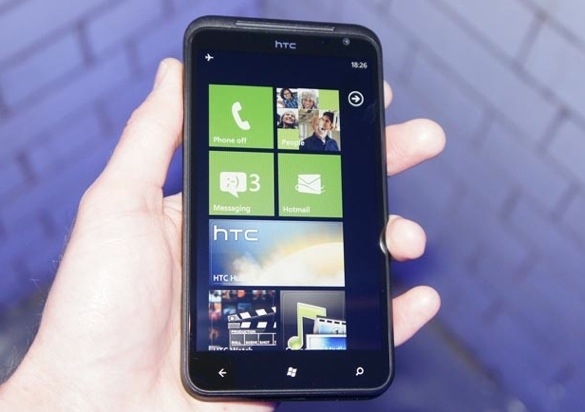 HTC's new Titan, running Windows Phone 7.5 has been announced. Besides it's beautiful screen, it has some interesting features, including a wide-angle camera lens. Put your browser in full-screen mode and hit the Read link for some more pictures. Well, I think 4.5" at that resolution would have made more sense. Also curious about the amount storage. I think we are still waiting for an official 32GB WP, aren't we? It's good to see at least 1 OEM attempting to hit the high end of the market though. I was very disappointed in the latest rumors of the first Nokia phone being low end - that will not get MS the market momentum they want. Not sure going overboard to 4.7" will though either. I do not know if 4.7" is too big; I would have to have a device in my hand to make the call. I have a HD2 and a HD7 and they are big, I really like them but, again, they are big already. The rest of the specs are not impressive to be honest: a dual-core processor even if MS OS does not support them yet would have been better; either when you pay $600/700 for a device or you get locked in a two years contract getting a piece of hardware that will last for at least two years is the wise way to go. As other has already said Windows smartphones are limited by that stupid decision made by MS to lock the storage and all these new devices coming with at most 16Gb of storage do not convince e much. Bottom line it seems an OK device but not something able to make me sell my HD7 and buy it. I do not know if 4.7" is too big; I would have to have a device in my hand to make the call. It feels quite good in the hand - the screen size doesn't make it feel too big, which surprised me a little. What would the point of HTC putting in a dual-core CPU if the OS doesn't support it? It would just sit there doing nothing. Would have been nice if they over-achieved in the memory as well as the CPU speed. Money possibly? Apple thinks going from 16 to 64G is worth $200 on an iPad Wonder what HTC would thinks it's worth?